The purpose of this set of articles is to take the base Xubuntu installation and show how easily it can be improved to make the best Linux operating system of them all. The first part was a review of Xubuntu where I reviewed the base install. In the second part of the I looked at how it is possible to customise all the aspects of the XFCE desktop to make it look the way you want it to look. The bit that needs to be worked on now are the applications. Xubuntu comes with a set of applications which will get you up and running and if you have an old computer the base set of applications will be just fine. If you are using a newer computer then whilst the XFCE desktop is brilliantly customisable the applications aren’t that exciting. So in this review I will be looking at 4 of the music applications you might choose to install to replace GMusicBrowser which is installed by default. The 4 chosen applications are Audacious, Banshee, Exaile and Rhythmbox. 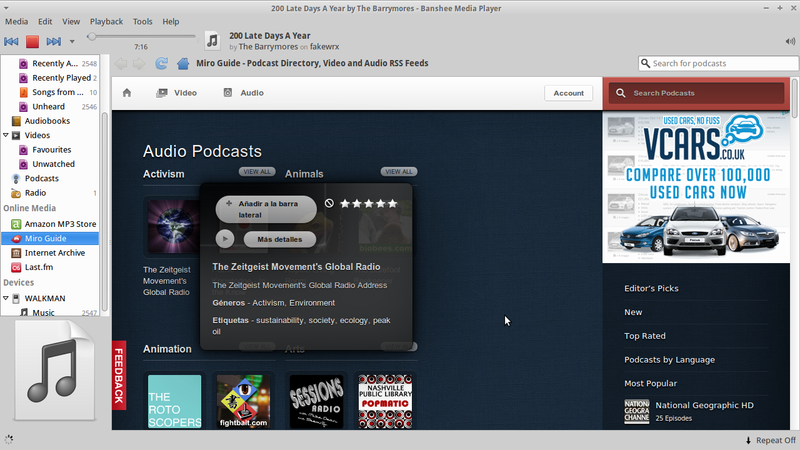 Audacious is a bit like GMusicBrowser in that it justs plays music. It isn’t really that fancy, it doesn’t connect to your external music players and it doesn’t have a webstore attached where you can download the latest music. There are also no online radio stations. The initial screen is a bit underwhelming but it can be changed to look a bit more pleasing on the eye and the WinAmp View image on the right is just example of this. You can add music from either a folder or a URL. Click the plus symbol to add music from a URL or the folder symbol to add music from a folder. I selected the Music folder and clicked add. All the songs were added in about 5 seconds (14 gb worth of music). You can choose to add different visual effects which are nice if you are just listening to your music and doing nothing else. There are a number of ways to output your music within Audacious including ALSA and PulseAudio. There are also a number of effects to choose from including echo, extra stereo, crossfade and voice removal. Now I am not going to pretend to be a guru when it comes to music. I listen to a lost of 80s rock music, a bit of 90s/00s ska punk and heavy metal. I therefore don’t get much benefit from a lot of the so called effects. What I can say though is that I expected voice removal to remove the voice content from songs and whilst it does drastically reduce the channels used for the vocals you can still hear them. 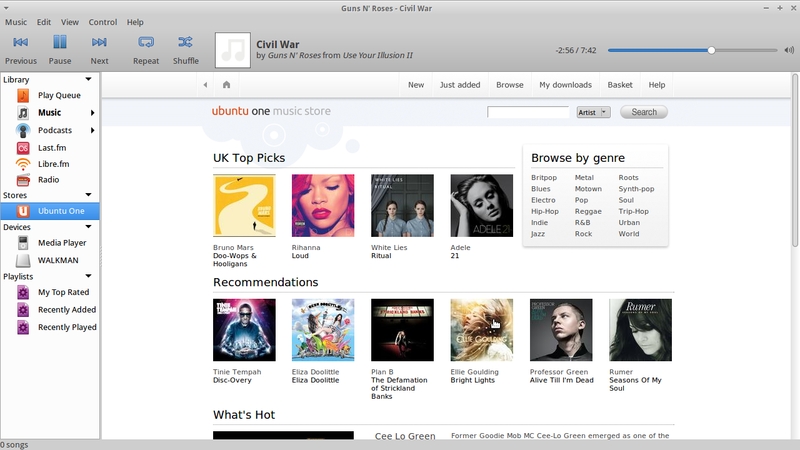 For me Audacious was ok but I’m not sure it is that much better than GMusicBrowser. It doesn’t contain the wow factor or any cool gadgets that are included in PMusic (Puppy Linux). The other thing that I wasn’t particularly happy with was the way playlists work. It is ok if you import playlists but if you want to create a new one you have to create the playlist and then import the songs into the playlist from the music folders on your machine. Not particularly intuitive. (Unless there was some secret technique that wasn’t obvious). 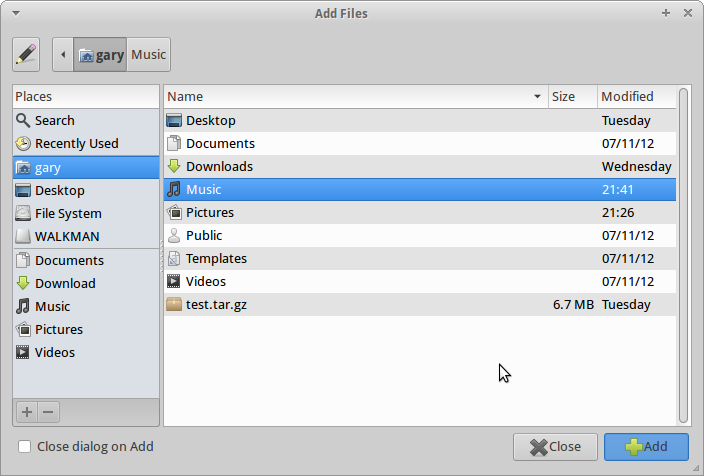 Just to clarify it is possible to import music from an external music player if it attaches itself as an external drive, simply by browsing the folder structure as if you were adding music from any folder. Banshee is a more complete experience when it comes to playing and managing your music collection. Banshee has support for music devices including iPods (supposedly, I have no way of proving this without selling my soul to the dark side and buying an Apple device) and the Sony Walkman. 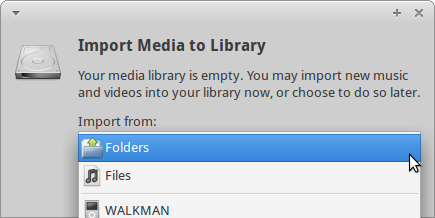 Importing media is simply a case of selecting “Import Media” from the menu. You have a number of places that you can import music from including your local drives, your music devices and the Amazon music store. Creating a playlist within Banshee is a pleasant experience. Simply select new playlist from the Media menu, enter a name for the playlist and then drag and drop the songs that you want within the playlist. It is possible to import online radio stations into Banshee so that you can choose to listen to them as and when you want to without finding them on your favourites list in your browser. It is a little fiddly (When you compare it to PMusic in Puppy which imports hundreds of radio stations for you already) in that you have to know the URL of the feed to begin with but you should be able to get that from most online radio station websites. As mentioned before you can connect directly with your external music devices. You are able to play the music straight from the device and of course synchronise to and from the device including adding and removing playlists. Banshee has support for playing Podcasts and there is a feature called the Miro guide which gives you the ability to search for podcasts. Finally if you have ran out of music and want to purchase some more pop into the Amazon store from within Banshee and download the songs you wish to buy and they are automatically imported into your library. Banshee was an altogether better experience than Audacious and provides much more functionality. Overall it is a music player that I could easily use on a daily basis. The cover art does take a little time to pull through though. Exaile is more along the lines of Audacious in that it is just a music player although it does have the ability to add online radio stations as well and it uses cover art which it seems to pull down at a much faster rate than Banshee. There is no obvious ability to connect to the Sony Walkman plugged in but on the install page it does say that it works with iPods but someone else will have to confirm that fact. Adding music is relatively straight forward. Select the option from the menu and then click the add button. You can choose to install from any folder. It is worth noting at this point that as with Audacious you can import from external music players if that player attaches itself as an external drive which the Walkman does. 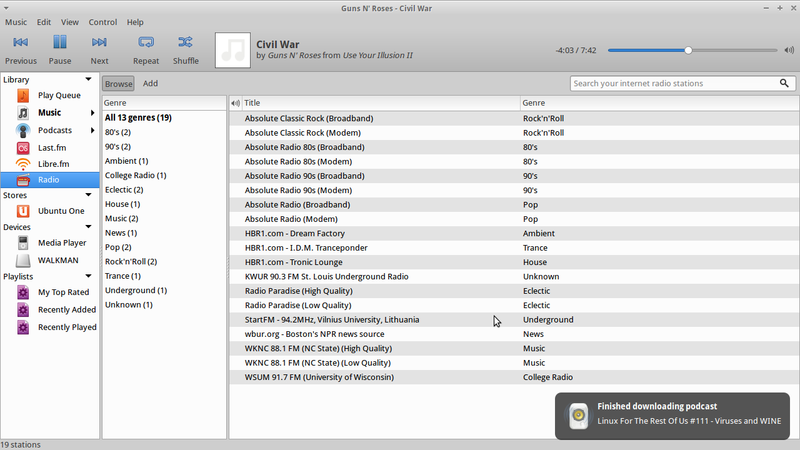 Adding a radio station works in a similar way to Banshee in that you enter a name and the URL to the radio station’s feed. Exaile might be your player of choice if you need something that is somewhere between Audacious and Banshee. Creating playlists was certainly easy enough. Pick a file (or files), right click and choose add to custom playlist. You can choose to add to a new playlist if you wish. I have to note that I had a few lags in performance when trying to switch from one playlist to another and at one point the application crashed. 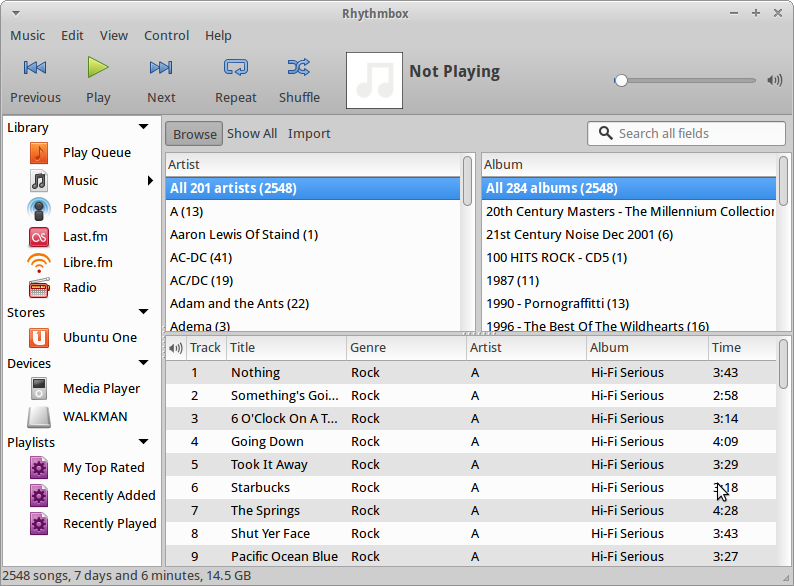 Rhythmbox is my music player of choice. It has all the functions of Banshee but it looks better and provides a better user experience. Adding music is a simple case of selecting Media and import folders and you are able to import all your music. It does seem to take a while longer than the other music players but no more than a couple of minutes. 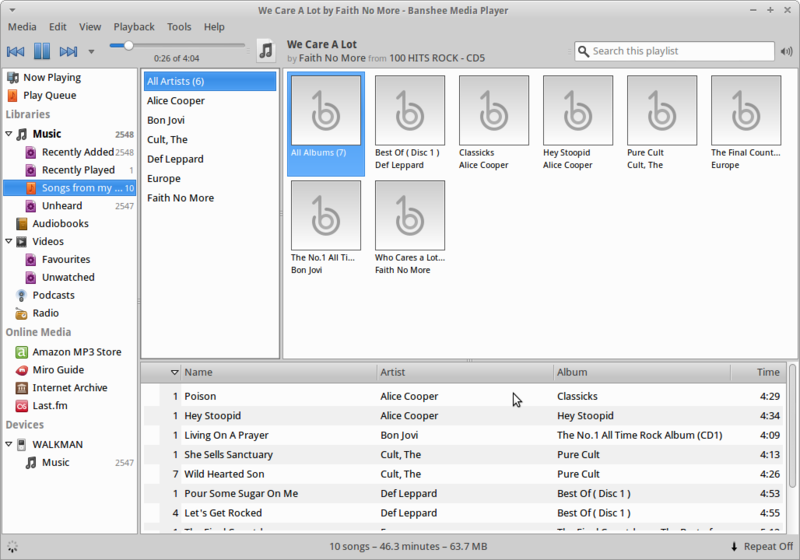 Rhythmbox gives you the ability to change the look and feel so that you can decide which columns are visible and whether you see albums and artists or genres and artists or all three. Rhythmbox doesn’t limit you to just music. You can also listen to podcasts and it also links to the Myra Guide to enable you to search for suitable podcasts. Another area where Rhythmbox surpasses Banshee is the list of preset online radio stations that are available. Most genres of music are covered but if you want to add in radio stations that aren’t there you can just by entering the URL to the feed. As with Banshee if you want to purchase new material you can do so within the application itself. 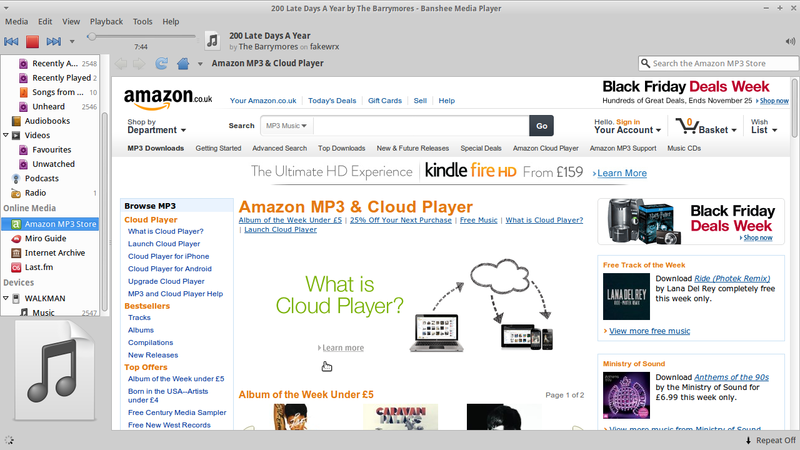 Rhythmbox uses the Ubuntu store to provide music as opposed to Banshee which uses Amazon. 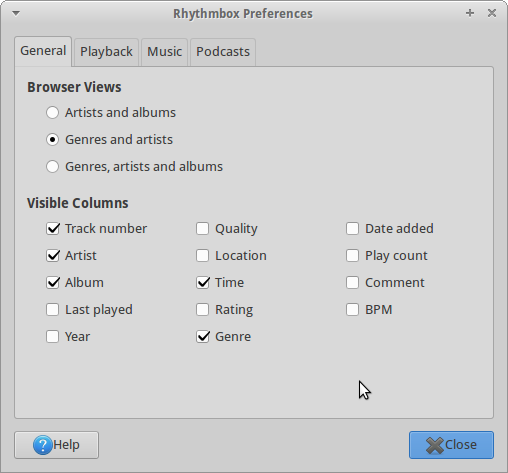 Creating playlists within Rhythmbox is easy. Simply right click on the files and choose the playlist you want to add the songs to or indeed create a new playlist. 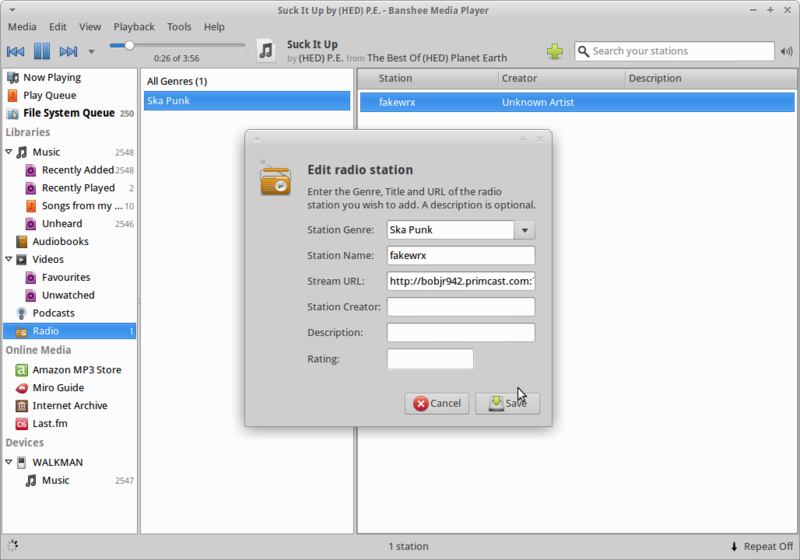 Media devices are picked up within Rhythmbox and it is possible to synchronise with the libraries on the computer simply by right clicking on the device and selecting sync. I did notice one issue with this and that is the fact that Rhythmbox picks up 2 external devices even though only one is plugged in. If I pick the wrong one then the other one disappears. I have to re-mount the device to get it to be picked up again. I really like Rhythmbox. 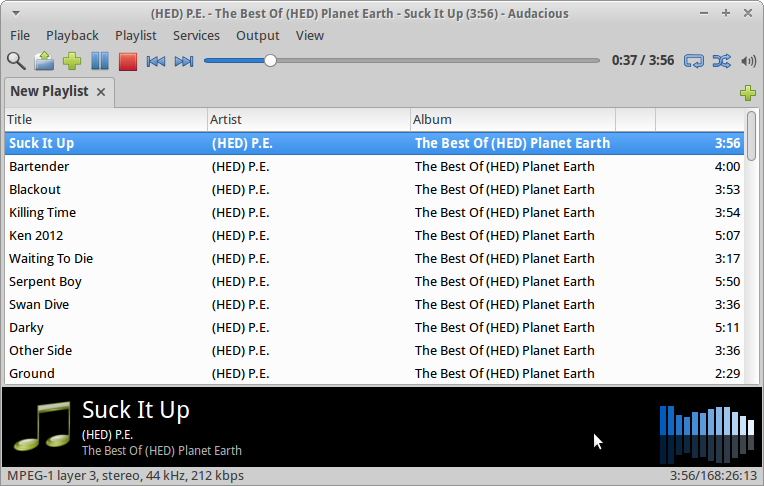 It is a really professional tool and so this is the player that I will be keeping within my Xubuntu build. 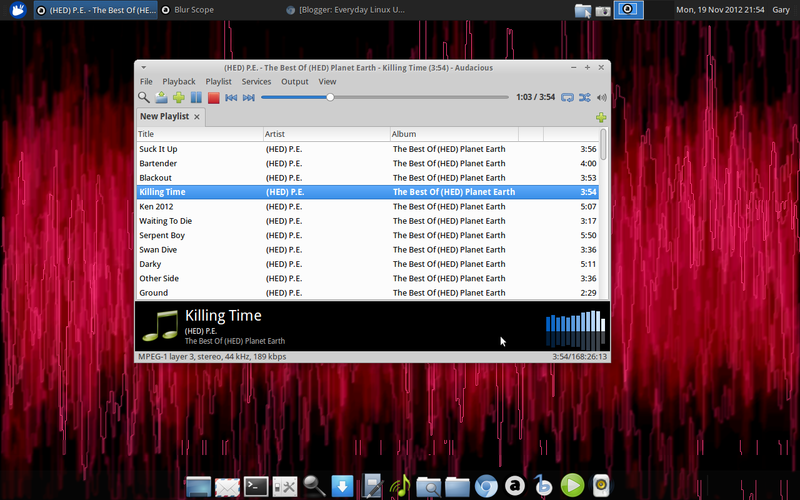 It is obviously down to everyone’s requirements and experiences with products as to which application will work for them but these are 4 music players that could work with Xubuntu to make it the ultimate operating system. There are of course other music players and I’m sure to be graced with comments such as “why did you not pick music player x or what about music player y”. Feel free to add your favourite music player as a comment or if you’d like to write a guest review about specific music players let me know. The next article in the Xubuntu series will be about office software. 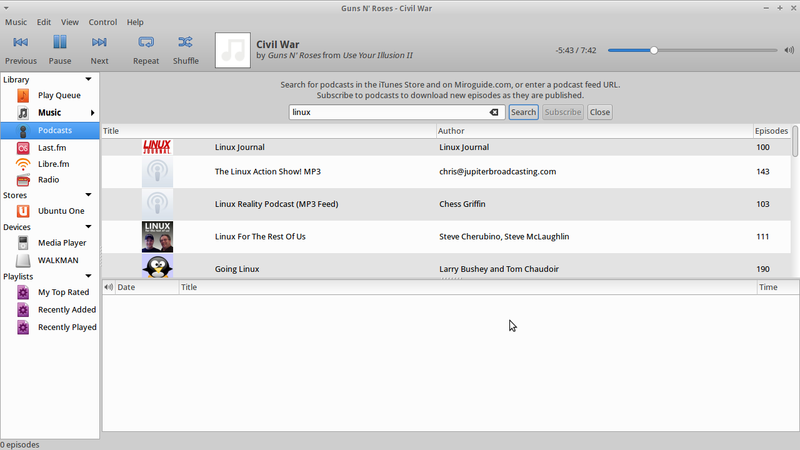 If you are looking for a review of another version of Linux then sign up to my twitter feed as one is coming shortly. Finally if you are working on a distribution (no matter how big or small) and would like a review please get in contact. 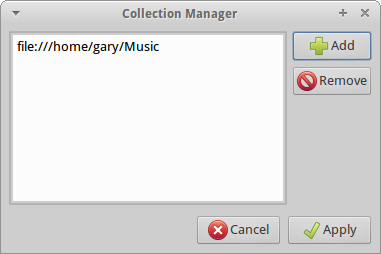 If you want a gtk music player. I suggest to take a look on guayadeque. If your are not restricted by the toolkit then clementine is a fairlygood choice too. 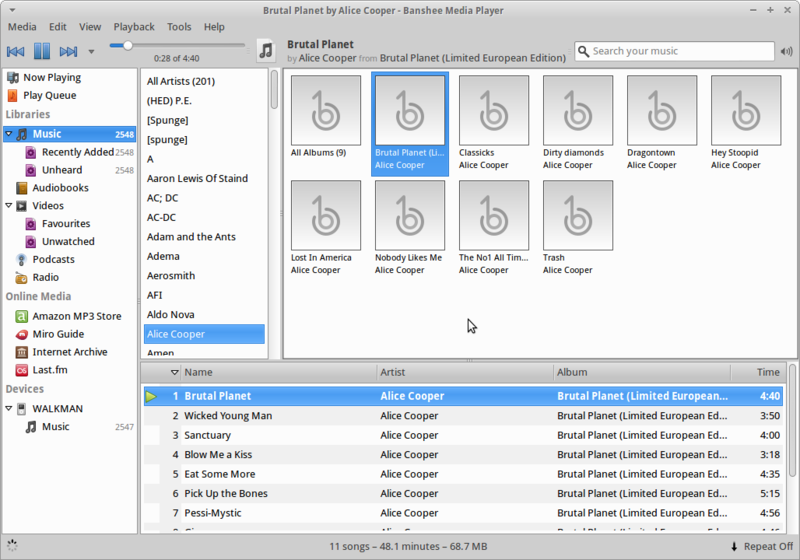 DeaDBeeF (as in 0xDEADBEEF) is an audio player for GNU/Linux, *BSD, OpenSolaris and other UNIX-like systems. There's also the Android version, which is a very different product. There are no Windows, OSX or iOS versions though, sorry for that. I agree with Vasiliy, I have used Deadbeef a lot. I use clementine and I'm more than happy. I use MPD/MPC and it's pretty awesome. It utilizes a client/server model, which means you always have an MPD server running and connect to it using e.g. MPC. Other clients are available such as GMPC. Overall, my favorite software because it's lightweight, simple, and does what I need it to do – play music. I as well suggest deadbeef over other players as it's really simple, robust and outstanding music player but of course that's a personal preference. before I knew about deadbeef (discover it somewhere at bbs.archlinux.org) I used to use audacious, rhythmbox and what not and none of them actually met my needs, so it's just my 2 cents on deadbeef. On the contrary I think Ubuntu has been great for Linux. I'm not a huge fan of Unity but I like the software center, the huge repositories and the general stability. Agreed, I like compiling my own software as much as anybody but if I can get it all out of the box with few problems and decent performance like Ubuntu offers I'm in. Besides, I don't see what so wrong with Ubuntu, it's not so different from Debian other than making a few things a little easier and being a much smaller download. Arch is alright but has too few packages in it's repositories and packages in the AUR don't always work, not to mention all the necessary fiddling. Ubuntu is real Linux, and thanks to Ubuntu, Linux is finally getting up to speed to the major operating systems in terms of software availability and quality whereas before it was convoluted mess with everyone doing their own thing their own way, often breaking backwards compatibility. I also use this Audacious audio player. A descendant of XMMS, Audacious plays my music how I want it, without stealing away my computer’s resources from other tasks. 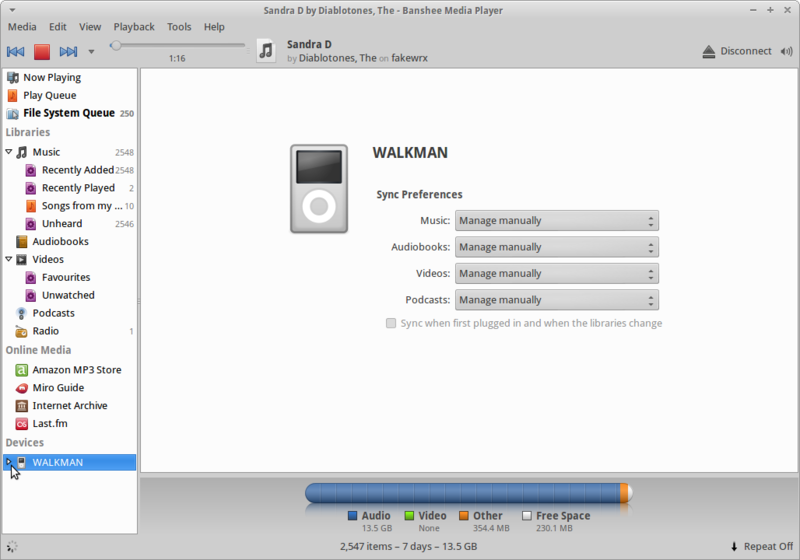 Running Xubuntu too I also found that guayadeque is the best music player after trying a few of them. I run Kubuntu on most all of our home computer, laptop, netbooks except 2 Xubuntu's on older desktops and Audacious is my favorite audio player. I love Amarok but sometimes I dont want these fullscreen interfaces that mimic the Apple one. I want something small, quick, that doesnt take a lot of memory or real estate on my desktop and be 'like Winamp' where I can just drag and drop 5-6 songs to listen. For all the family members that I have switched to Linux (i offer them a few desktops but no one wants Unity. Zero. Nada. Not one person coming from Windows wanted to use it after testing it out on my laptop), VLC is the video player I put on and Audacious is the audio player. If you have people coming over from the dark side that used Winamp, Audacious is the way to go. There were so many music apps to choose from and I am well aware of Deadbeef and Clementine. I've really only used Clementine once when I used a KDE based distro. I don't really like the KDE desktop all that much. This might be a naive question. Would installing clementine involve installing lots of other packages to get it working with Xubuntu and therefore add more bloat? I would probably have chosen deadbeef and Gauyadeque for an ultimate lightweight operating system but I wanted to go for Rhythmbox and Banshee because they had more features overall. Clementine does not depend on any kde libraries. You will need Qt however. I thought I'd mention Quod Libet as one of my favorite music players. It will also fetch a list of radio channels to choose from if you want it to. It's pretty customizable as well. For those interested in learning more about Clementine I wrote this article. Yes at first I wasn't a big fan of Guayadeque but now I think it definitely has advantages over other music players especially the ability to rip music.